Every year there is a world-wide birthday party on my sister's birthday. A huge crowd gathers in Times Square in New York City; indeed in all major cities around the world. Party goers count down... 10, 9, 8, ... 2, 1... to the instant her birthday ends, and a huge glittering ball drops. Fireworks erupt, streamers descend, champagne corks pop, and strangers kiss one another. She is another year older. The birthday celebration is a little more subdued at our house, but nonetheless joyous. We celebrate with cake, presents, and flowers. 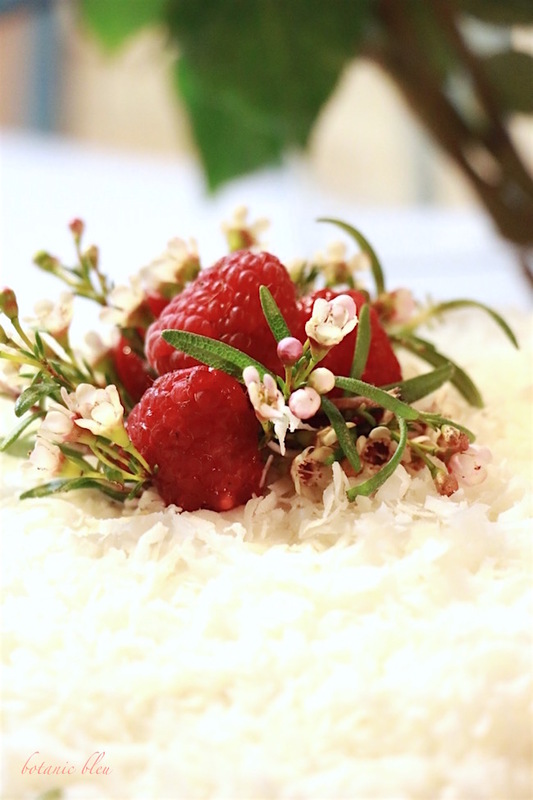 This year the cake was coconut cake topped with raspberries and wax flowers. 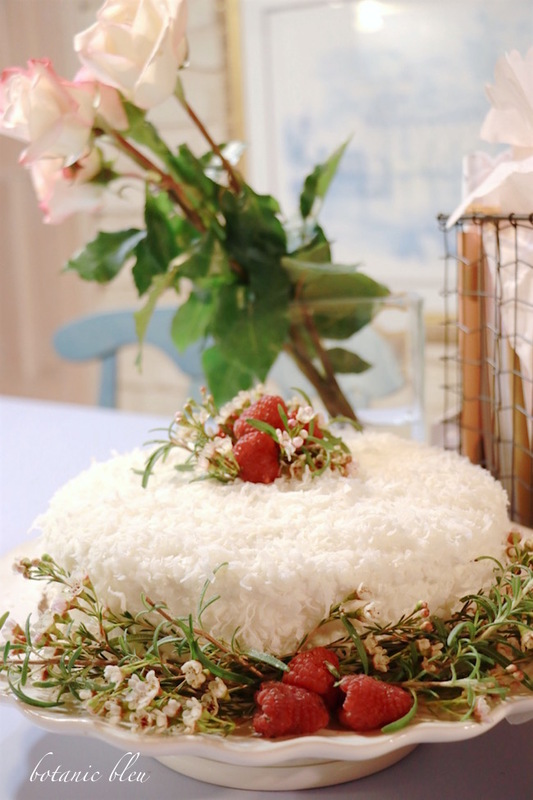 Our secret between us... start with a cake purchased from a bakery and add fruit and flowers to decorate it. The cake goes from just being a cake to a special cake for a special occasion. La Madeleine, a French bistro and bakery in the Dallas-Fort Worth Metroplex, makes delicious cakes that are moist and flavor-filled. This coconut cake has creamy, pudding-like icing between the yellow cake layers and tastes heavenly... homemade. TIP 1: Check whether the flowers you plan to use are toxic before putting them on a cake. Just search online. "Are wax flowers toxic?" Insert the name of the flower you want to use in place of the underlined wax flowers in the sample question. 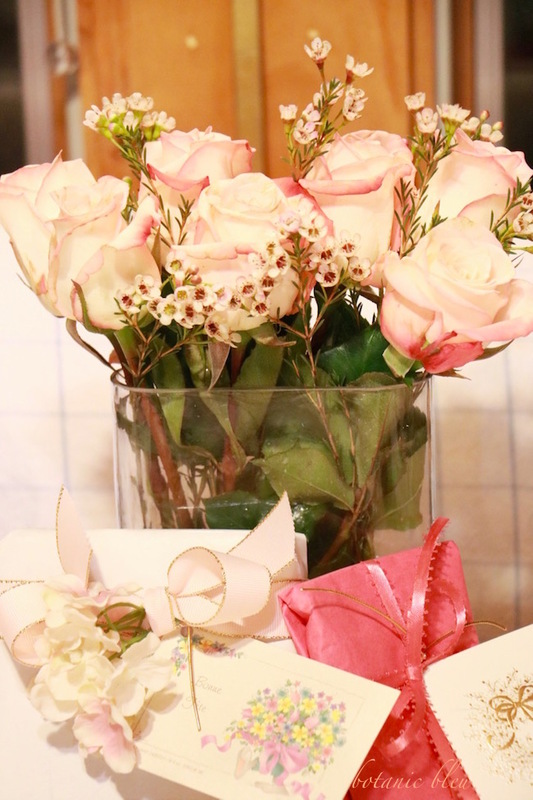 TIP 2: By using some of the wax flowers in a bouquet of peach-tinged roses, the party bouquet coordinates with the cake. Subtle details like repeating colors, textures, or flowers create a finished look to party decorations. Most people are not aware of the details that make the difference in final touches, but their minds sense the unity created by repetitive use of colors, textures, or flowers. With just a little extra added to a ready-made cake, the cake and party become very special... worthy of a spectacular new year's eve celebration... with a minimum of time, money, and expertise. What a great idea to make a cake more festive. You certainly do birthdays right! What a lovely way to adorn a bakery cake! A Happy Birthday (and New Year) to your sister. Happy New Year!! Thanks so much for stopping by!! PS Huntsville was wet and dreary over the holiday weekend. A late Happy Birthday to your sister! What a lovely cake and idea! With my sister in AL and me in AZ, we have not celebrated birthdays together for a very long time - you are so fortunate to have your sister close to celebrate with her! I have had the pleasure of eating at La Madeleine in Dallas - it was wonderful! Blessings for a great new year to both you and your lucky sister! The cake is gorgeous and what a great tip! Here I was thinking at first that you made it and was feeling a bit sad for myself and my cooking skills. But I can decorate anything, so why not? Judith, a good coconut cake is delicious and can look very winterish. I love the way you've decorated it. I always worry about people putting toxins on their cakes through flowers that are toxic in themselves or toxic from all the pesticides used in the floral industry. Love the tip about repeating elements to bring the cake and the flower arrangement together, and without getting too matchy-matchy. I think I'm going to learn a lot from your blog! Happy birthday to your sister! Pretty way you embellished the cake. Thanks for sharing at Home Sweet Home! Wow...that's some birthday party! ;) I am sure that even the ball couldn't compete with that cake though...yum! Happy birthday to her! That delicious looking cake is a gift in and of itself! Here's to a wonderful new year!